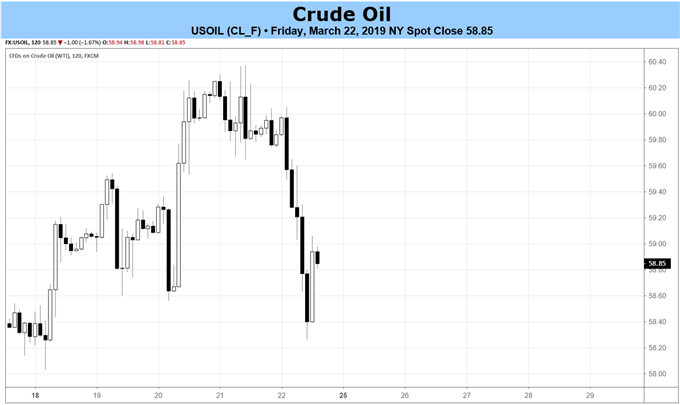 - News early in the week that OPEC would be canceling their April meeting initially help Crude Oil prices rally into their highest level since November 12. - As more of the US Treasury yield curve sinks into inversion territory, concerns about the state of the US economy and global growth in general have flared – hitting oil prices hard by the end of the week. - The IG Client Sentiment Indexshows that retail traders are buying the Crude Oil dip – a contrarian signal that more losses may be yet to come. After climbing through the first four days of the week to hit their highest level since November 12, Crude Oil prices dropped dramatically on Friday as a fresh wave of concern over the state of the global economy provoked a sell-off in high beta assets, growth-related commodities, and the risk-correlated currencies. The -1.97% drop on Friday saw Crude Oil cut its gain for the week down to 0.89% overall. Heading into the last week of the month, Crude is up by 3.18% since the start of March. The positive performance by Crude Oil last week can be attributed directly to a report on Monday that said that OPEC would not meet in April. Evidently displeased with the state of global demand, the major oil producing countries are intent on keeping the supply cuts in place until at least their next meeting in June. 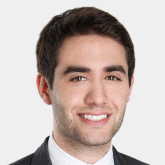 Against a backdrop where the Trump administration may announce fresh sanctions on Iran and Venezuela, a prospective constrained supply picture over the next few months has quickly emerged. Even as it appears the global energy supply will be constrained over the near-term horizon, markets may have reached their breaking point with respect to concerns over the global economy. The March Fed meeting on Wednesday jumpstarted the drop in yields on Wednesday, but the US Treasury yield curve’s inversion by the end of the week may have been the proverbial straw that broke the camel’s back. While the US Treasury yield curve has been inverted at various points since late last year, it was only recently that we started to see the key spreads – the 3m5s and 3m10s – move into inversion territory for the first time since 2007. Why does the US yield curve inversion matter? In the post-war era, every occasion in which the 3m5s and 3m10s yield curves have remained inverted for two consecutive quarters has pre-dated a US recession 100% of the time. Crude Oil prices may prove to be disadvantaged in an environment where global growth concerns begin to pick up. The latest round of API inventory data showed that US crude inventories dropped by an unexpected 10M barrels, but a look under the data’s hood shows that nearly 70% of the drawdown was related to an uptick in exports (reflecting the aforementioned supply concerns). Amid market participants proving increasingly jittery over global growth, another round of data that show supply remains tight could prove to help buoy Crude Oil prices come mid-week. 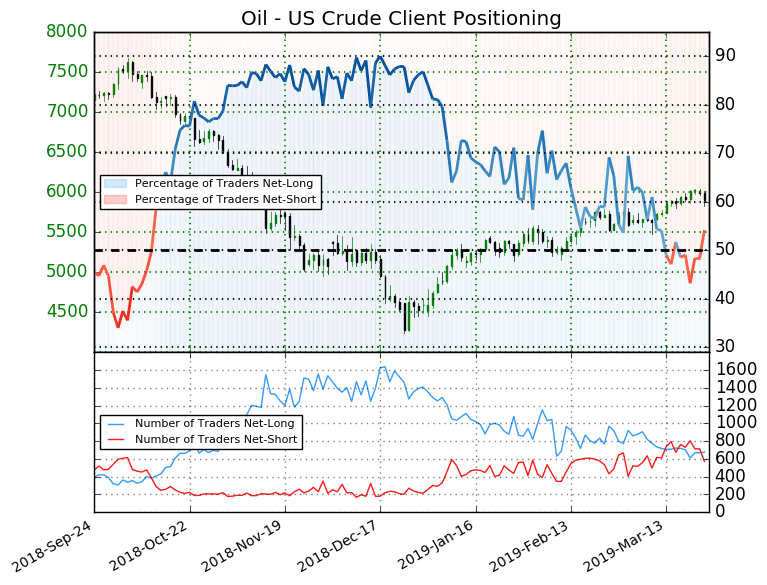 Finally, looking at positioning, according to the CFTC’s COT for the week ended March 19, speculators increased their net-long Crude Oil positions to 414.8K contracts, up from the 362.3K net-long contracts held in the week prior. Net-longs have now climbed for the past five consecutive weeks after bottoming out during the week of February 12, 2019. 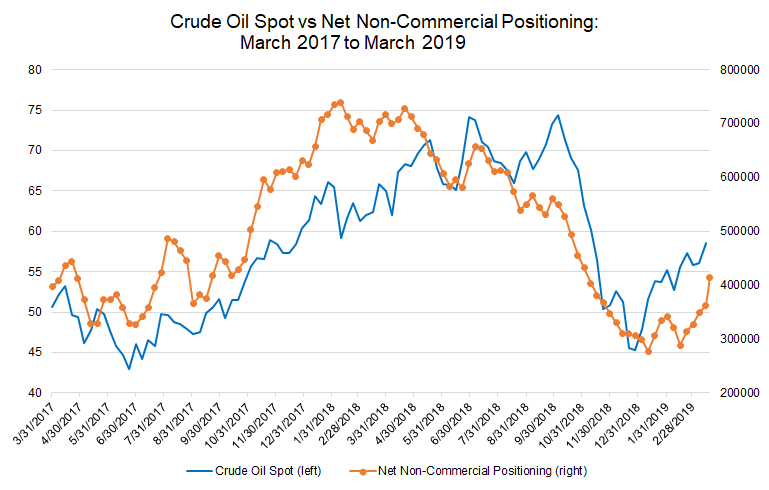 Positioning remains a significant distance from the highs seen over the past two years, which were 739.1K net-longs during the week of February 6, 2018. Retail trader data shows 54.1% of traders are net-long with the ratio of traders long to short at 1.18 to 1. The number of traders net-long is 2.0% higher than yesterday and 4.4% lower from last week, while the number of traders net-short is 19.7% lower than yesterday and 15.0% lower from last week. We typically take a contrarian view to crowd sentiment, and the fact traders are net-long suggests Oil - US Crude prices may continue to fall. Traders are further net-long than yesterday and last week, and the combination of current sentiment and recent changes gives us a stronger Oil - US Crude-bearish contrarian trading bias.